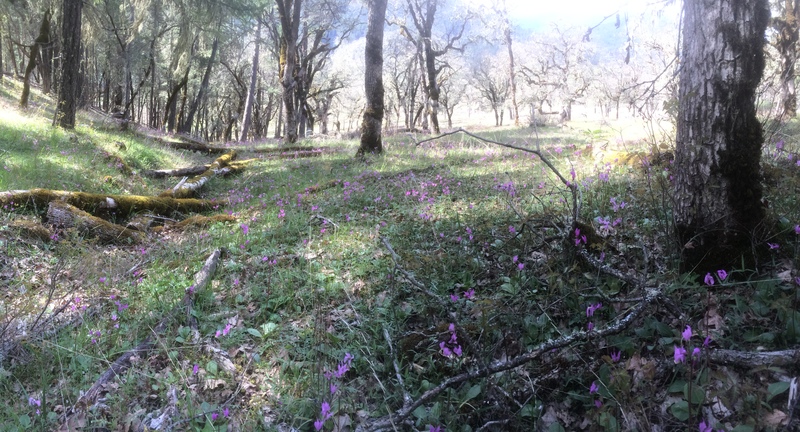 Shooting stars (Dodecatheon hendersonii) in oak woodland in the spring. It’s been quite the winter in the Klamath-Siskiyou this year. I write this with two and a half feet of snow outside and a one and a half mile snowshoe to the nearest plowed road — an unusually big snow year at 2,100′ in elevation! As winter settles in and you start daydreaming about springtime and wildflowers, take some time to reflect on wildflower seed mixes as well — more specifically, what species are actually in those wildflower seed mixes? If you support the conservation of native flora, intact ecosystems, biodiverse landscapes, traditional ecological knowledge, or if you belong to a native plant society, or other environmental organization that works for land conservation or pollinator advocacy, for example, you may be just as dismayed as I am to learn that many commercially available packets of “wildflower” seed mixes don’t actually contain native wildflower seed at all, and may, in fact, contain noxious weed seeds. In most commercial wildflower seed packets the term “wildflower” is often used to refer to species that naturalize easy, or in other words, species that can can take over quickly and flower profusely, spreading themselves around in abundance. Unfortunately, this describes many non-native species that take over native plant habitat, displacing native flora and impacting floral diversity as well as pollinators adapted to native plants. Your winter daydreams of vibrant wildflower meadows flowering in profusion may turn into a noxious weed nightmare if you don’t do your due diligence in researching what species are in a wildflower seed mix. In an unpublished study from 2002, a University of Washington undergraduate student researcher grew out the seeds from 19 “wildflower” seed mix packets. The result: All 19 packets contained from 3 to 13 species that were identified as being invasive in some part of North America. And even worse, eight of the plants were identified as noxious weeds. Bachelor buttons easily escape gardens and invade nearby native plant communities. 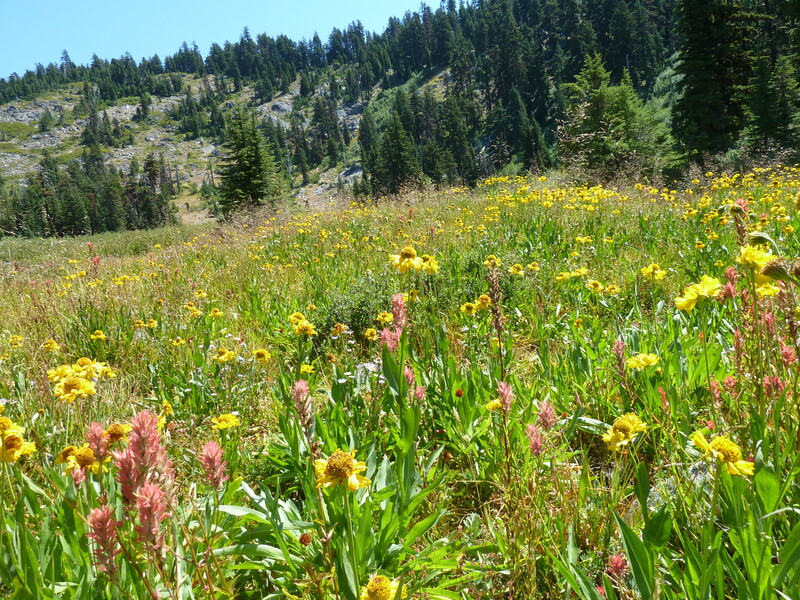 Peaceful Valley’s “Regional Northwest Wildflower Mix”: Aquilegia vulgaris, Centaurea cyanus, Cheiranthus allionii, Chrysanthemum Maximum, Clarkia amoena Semi-Dwarf Single Mix, Clarkia unguiculata, Collinsia heterophylla, Coreopsis lanceolota, Eschscholzia californica, Gilia capitata, Gilia tricolor, Layia platyglossa, Linum grandiflorum rubrum, Linum perenne, Lupinus densiflorus, Lupinus polyphyllus Russell Strain Mix, Lupinus succulentus, Nemophila menziesii, Papaver rhoeas, Phacelia campanularia, Rudbeckia hirta. Sustainable Seed Company’s “Northwest Wildflower Mix”: Baby Blue-Eyes, Bird’s Eyes, Black-Eyed Susan, Blue Flax, California Poppy, Chinese Houses, Clarkia, Dwarf Godetia, Corn Poppy, Five-Spot, Globe Gilia, Lance-Leaved Coreopsis, Mountain Phlox, Russell Lupine, Scarlet Flax, Shasta Daisy, Siberian Wallflower, Sweet Alyssum, Tidy Tips and Yellow Lupine. Seed Savers Exchange’s “Flower, Bird and Butterfly Mix” doesn’t list the species that are in this flower mix, but the photo that accompanies it depicts bachelor buttons as being part of the mix. When you buy seeds from Klamath-Siskiyou Native Seeds you can be rest assured that 100% of the species in our inventory are native to the Klamath-Siskiyou mountains, valleys, grasslands, woodlands, rock outcrops, or forests. Our seeds are wildcrafted from genetically diverse stock that is regionally adapted and beneficial for the local wildlife and pollinators that have evolved and adapted with them. Healthy, intact ecosystems depend on thriving native plant communities!